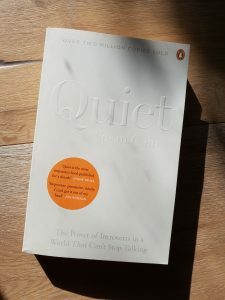 This is an engaging, informative and insightful book which helps introverts understand themselves, and how to succeed in a predominantly extroverted world. Cain argues that introverts tend to be highly undervalued, particularly in leadership positions and that introversion is considered a second-class personality trait, whereas extroverts are rated as smarter, better-looking, more interesting. The premise of the book is to dispel such beliefs, and to show, for instance, the importance of introverts as leaders. It includes an in-depth review of the science and history behind introversion, and discussions relating to the cultural context of how introversion and extroversion are viewed. About one third to one half of people are introverted!